Thanks to Dr. Syed Sarwar Ali, The Aga Khan University Hospital (Pakistan), for contributing this case and the discussion. To contribute a Case of the Week, follow the guidelines on our Case of the Week page. (1) We have finished updating the Thyroid chapter with images contributed by Dr. Mark R. Wick. We have also edited the AFIP images in this chapter by adding long captions to the image files so that the image and caption can be simultaneously viewed. Please take a look at Anaplastic carcinoma as an example and let us know what you think (the AFIP captions are under Micro images / Images from AFIP / Vascular Invasion). (2) We have updated the Skin-melanocytic tumor chapter based on reviews by Christopher Hale, M.D. (3) Next month, we will begin sending out our new Oncology newsletter quarterly with information on new pathology related drugs and other tumor related information for both oncologists and pathologists. Click here to sign up to receive this free newsletter. A 45 year old man was admitted for high grade fever, rigors, chills and shortness of breath. He also had anuria and generalized weakness. His medical history included hypertension and diabetes. Physical examination showed a disoriented, pale and icteric man with 102 F temperature, tachycardia and 98% oxygen saturation at 5 liters. The CBC showed (reference ranges in brackets): Hemoglobin 8.1g/dl (13.7-16.3 g/dl), hematocrit 23.2% (41.9-48.7%), WBC 4.6 x 10E9/L (4-10 x 10E9/L) and platelet count 16 x 10E9/L (150-400 x 10E9/L). His prothrombin time was 12.1 seconds (9-14 sec) and APTT was elevated at 52.7 seconds (25-35 sec). Liver function tests were: total bilirubin 10.9 mg/dl (0.1-1.1 mg/dl), direct bilirubin 7.2 mg/dl (0.0-0.2mg/dl), indirect bilirubin 3.7 mg/dl (0.1-0.8 mg/dl) and creatinine 1.9 mg/dl (0.9-1.3 mg/dl). 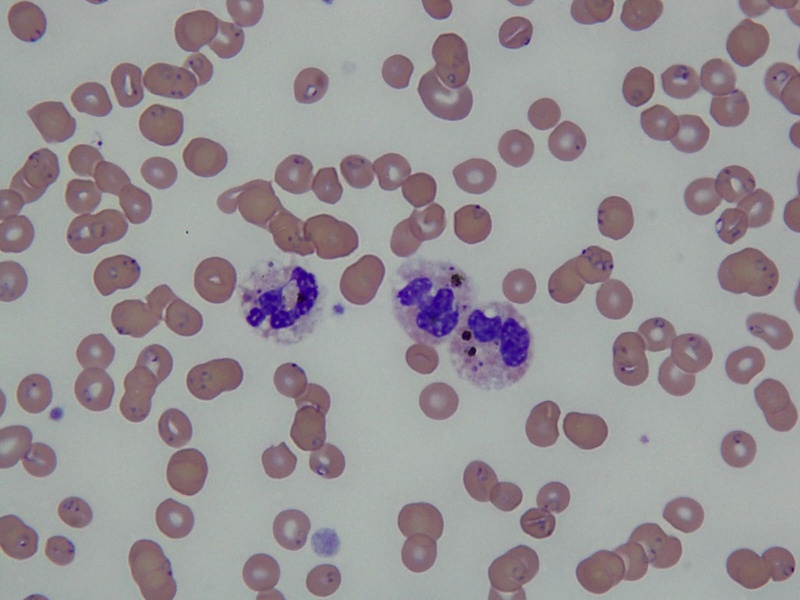 The blood smear review displayed heavy infestation with Plasmodium falciparum with 60% parasitemia. Erythrocytes with double parasites were also observed. 10% of neutrophils had visible malarial pigments or hemozoin. A diagnosis of severe falciparum malaria with multi-organ failure was made. Shortly after admission, he developed cardiac arrest. He revived initially with CPR and full supportive measures, but later died. Malaria is the single most important disease hazard from travel to developing countries. Worldwide, there are over 200 million annual cases with over 600,000 annual deaths (Wikipedia, US Centers for Disease Control, World Health Organization). 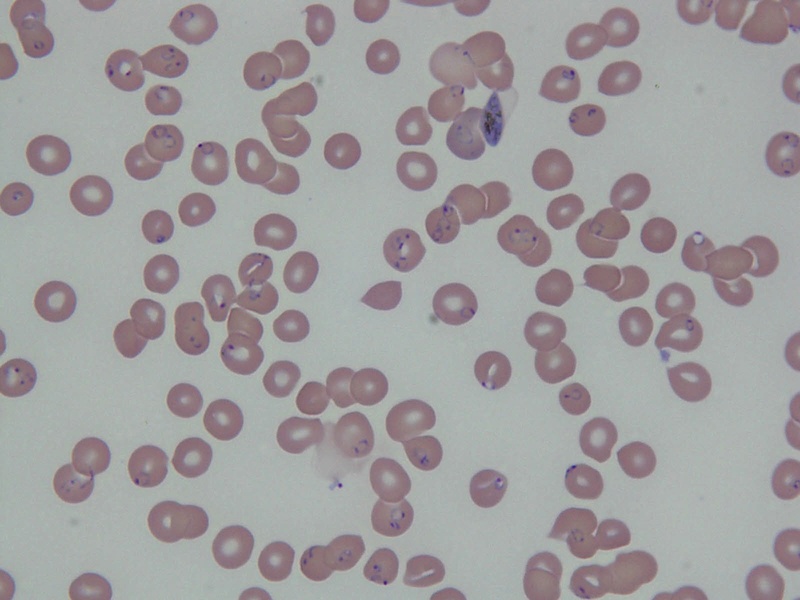 Hematological indicators of poor prognosis in severe malaria include a platelet count < 50 x 10E9/L, prolonged PT >3 seconds, prolonged APTT, fibrinogen < 200mg/dl, hyperparasitemia > 100,00/uL (high mortality if >500,000/uL), > 20% parasites and > 5% neutrophils containing visible malarial pigment. Early recognition and prompt management are important.